Never before have I read such a stark and poignant album title. 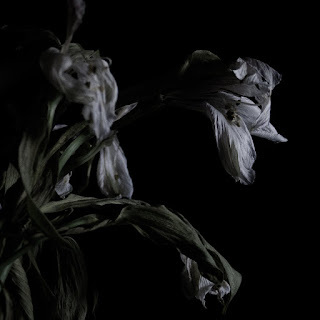 "As We Cup Out Hands And Drink From The Stream Of Our Ache" (released in June via the band and due out on vinyl in August via Gilead Media) is the new full-length for Wisconsin doom band Cavernlight and it follows on from their 2015 release "Corporeal". With this album, the quartet promises a journey into their personal void. This evening the sky and atmosphere sits heavy, like the heavens are building toward a sinister spectacle. What better way to herald that spectacle in than with this record. Album opener Lay Your Woes… starts with unnerving noise and ambience. The riffs and percussion are at crawling pace while the shrieked vocals come from the lungs of a tortured soul. That initial passage of heaviness morphs into stoner-like groove and hallucinogenic soundscapes, with subtle metal piercing them before Cavernlight slows the tempo with their doom/sludge hybrid. Quite an impression is made during the first song alone. This year is producing some of the best doom/post-metal in years and it may be presumptuous of me to say this but Cavernlight belong’s on that list. Constructing A Spire… only drags their sound down a deeper mire and crawls with bass-heavy riffs and screams that sit deep within the noise. Nightmarish and arduous may be adequate descriptors for the song, but they are meant in the best possible way. This is not for the casual listener. Wander, Part II is a break from the bleak heaviness but it contains it’s own beauty with the help of minimal ambience and guitar presence. It reminds me of the misty and dark moors of my home county. The melodic guitar intro that greets you on To Wallow… is a moment worth waiting for. It’s cinematic majesty is beautiful, though it feels like it’s leading you into a false sense of security. Thankfully, it remains as Cavernlight unleashes more stark noise. For such a song and indeed album, the music within is cleansing and cathartic. The clean classical female singing on album closer A Shell Of One’s Former Self is not expected but is remarkable in it’s fragility and that fragility is shattered mid-way through by one last earth-shaking passage. It seems more tortured this time yet when the clean vocals return alongside Cavernlight’s dissonant textures, the song takes on a new life. At times “As We Cup…” is an uneasy listen, yet there’s a reason for that and when the light shines through Cavernlight’s music it’s truly brilliant. There's also vinyl and tape pre-orders up via Cavernlight's bandcamp page.